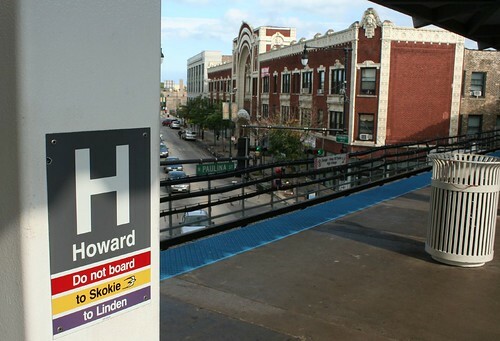 I’ve become fascinated with the oddball of the Chicago Transit Authority’s light rail system, the Yellow Line – aka the Skokie Swift. It’s such a mismatched, out of place beast that I have to stop and stare every time I come across it. The trains are just two cars, two lonely little tiny cars rolling along all by themselves like lost sheep, wandering innocently past suburban lawns and parks and back yards and arterial roads. They’re so cute! You just want to pinch their little metal cheeks. Whether it’s running at grade between 1950s backyards, flying above a river on a trestle, or roaring through a forest in a below-grade cut, the Yellow Line just leaves me wondering: what is it doing here? What are grungy CTA cars doing out in the June Cleaver suburbia of Skokie? Did they get lost or something?? The Swift is a relic of an aborted idea, back when people and governments hadn’t quite completely given up on mass transit. Surely light rail could find a way to work in the suburbs, right? And so this line was activated in the 1960s on 5 miles of semi-abandoned right-of-way that had passed from a defunct private transit company to the CTA. 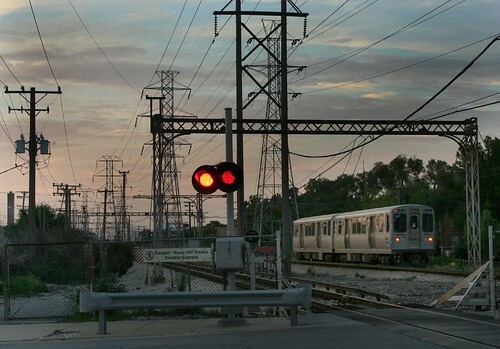 The Skokie Swift served a test bed to see what was possible out in the new suburban frontier. The notion was that a really fast, no-stops, no-frills run from a suburban center into Chicago could be a viable transit model. And it worked pretty well – better than expected, in fact. Ridership was higher than predicted, enough so that the train still runs every 10 minutes or so daily. 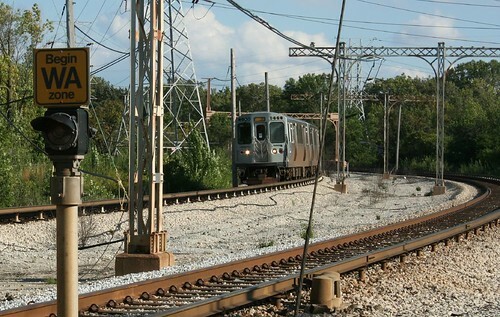 But it wasn’t such a success that the model was replicated; the Swift remains a one-of-a-kind line in Chicago, rivaled only by the Purple Line for its strange intrusion into suburban woodlands. Part of the Skokie Swift’s fascination is that so many relics of the past remain in place. 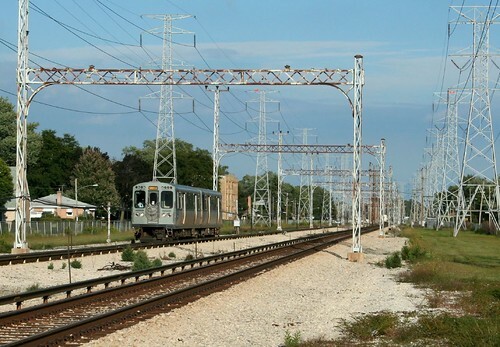 Much of the western half of the line still passes under the catenary poles that once held overhead wires, used when the line was electrified from above. The lines were taken down when full third-rail service was added in 2004, but the poles remain. And that little stub at right is the remains of a one-time station platform, now used only as a housing for electrical boxes. 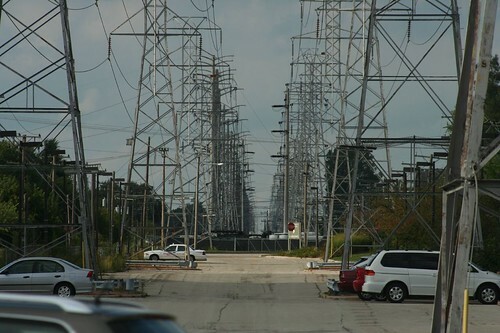 The right of way is also quasi-industrial, lined with huge power lines that give the line a sort of apocalyptic feeling. The train is taking you to wherever it is that all these electrical lines go, and when you get to that ominous, distant place, who knows what fate might befall you? Maybe you’ll be made into electricity, too. When you finally do reach the end of the line, it’s a surreal spot – a seemingly random point, surrounded by parking lots and light suburban commercial buildings, not enough to constitute a downtown or village center, or even much of a place at all. 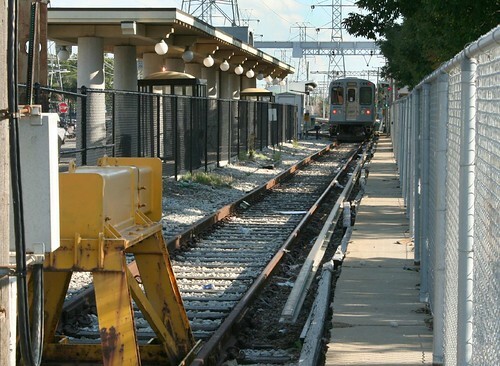 This humble bumper marks the very end of the CTA rail system. Across the street, the power lines continue their relentless march northward, beckoning for an expansion of the line. That expansion is in the planning phases at present. The other part of the fascination is, as mentioned, how strangely out of place the Swift is. 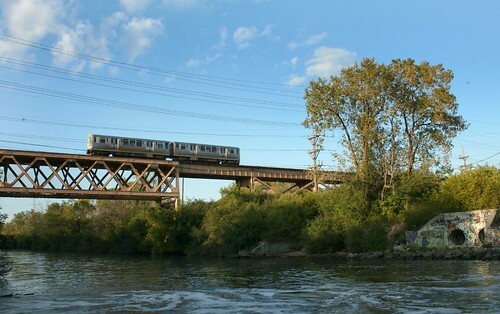 It’s a tiny train running through huge places, running on towering trestles and over hugely busy roads like McCormick. 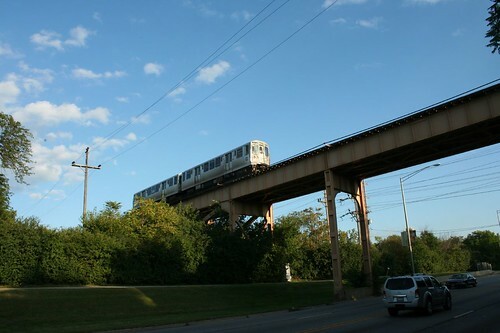 CTA cars mostly run in cramped quarters in the city – tight subway tunnels, or squeezed between residential streets with houses so close that residents can almost touch the track structure from their windows. Their compact, no-nonsense design reflects this, and looks very strange in all the open space of Skokie. This entry was posted in CTA, Skokie. Bookmark the permalink. 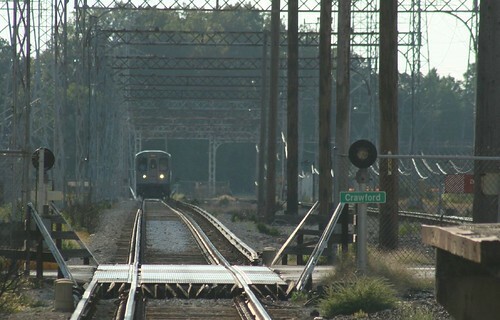 I once got on a two-car South Shore train just after sundown at Dunes Park. It was very similar to what you just described, I think. Thanks so much for posting these photos! I never thought to actually take and/or investigate that little Yellow line… will definitely have to do next time I'm in town. The Yellow Line's the greatest Time Machine route. You got your 90s, 50s, a beautiful apocalyptic wasteland and the modern day Howard Station.Even though I hate the CTA with a passion, the Yellow Line is the most interesting line and alongside the Loop, is probably what makes the CTA a unique oddity. Wonderfully photographed and written–and funny too. And thanks so much overall for writing this blog…you've opened my eyes to some really cool sights in this fair city! Seeing the train cruise overhead while I'm on McCormick always surprises me. I feel like I'm in one of the model train sets I used to play with when I was a child. I like this essay, but it fails to mention the most important reason for the existence of the yellow line: The CTA had a service barn in Skokie accessible by private railroad tracks. 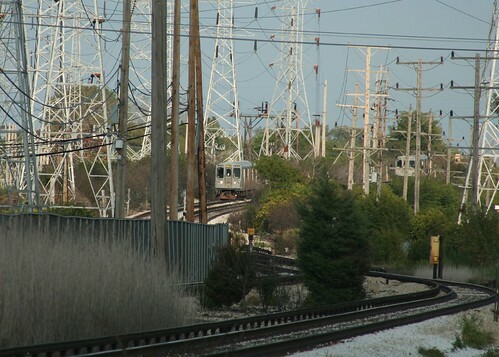 When the railroad went out of business, the CTA had to buy the line in order to continue to use the facility. Great essay, but it's heavy rail, not light rail. Chicago doesn't have a light rail system. 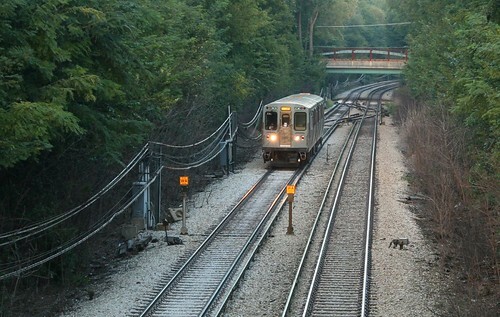 The "L," including the Skokie Swift Yellow Line, is all heavy rail. Great recognition for the Yellow Line. One correction: The CTA 'L' is a heavy rail system. Oh man, this was the best story about a transit line I've ever read. Love the apocalyptic aspects, and the strange arrival in a nowhere land. Poor little CTA cars, so far away from home! 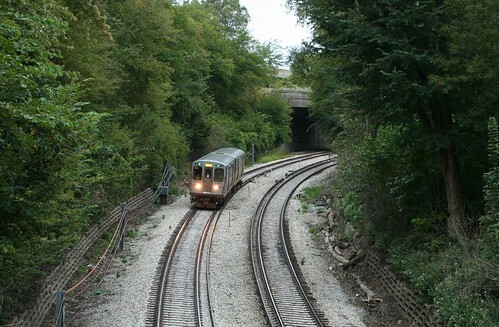 At one time the Skokie Swift trains consisted of a single car. The North Shore line had a few one car trains also. I happen to be a rail/transit fan. Have been one, since I was about 4-5 years old. My Mother (God Rest Her Soul), “sowed my interest in trains, ” when she used to go shopping at Wilson & Broadway, back in the early to mid 1950’s. While she went shopping, I would either stand outside the A & P Store under the “L” Tracks at Wilson & Broadway, OR ON THE CORNER ITSELF, and watch the CTA “Nee Chicago Rapid Transit,” and or North Shore Line Trains go by on the “L”, and up till 1957, the #36 Broadway State Streetcars, on Broadway proper. 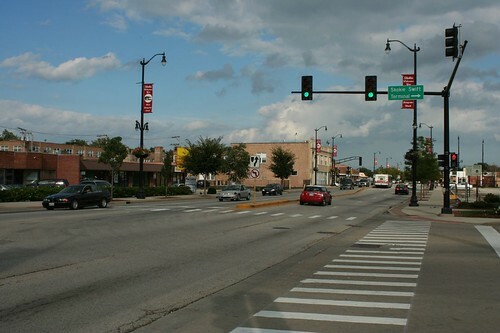 Later she took a job as a waitress at the Evanston Golf Club in Skokie Illinois, which required her taking the North Shore Line to Dempster St., which is the present North Terminal (Although THERE WAS TALK, of extending it farther north. Anyway, she would purchase a half rate ticket for me on my beloved North Shore Line to Dempster St., and I would ride the #97 Skokie Bus back to Howard St. where I would either take the “L”, back to Argyle St. or a #22 Clark St. bus, WITH THE HIGH WINDOWS. Anyway, my beloved North Shore Line died on A BITTERLY COLD JANUARY DAY, in 1963. I rode with my Brother that day, with a very heavy heart, knowing that, a piece of Chicago History, was passing from us, FOREVER. Thank you, for bring back such memories. Adorable is right. Hope you check out my blog, fellow Chicagoan! 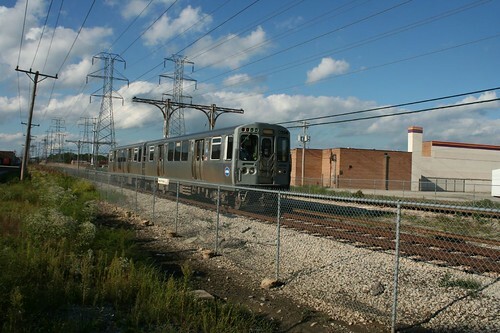 Miss the Skokie Swift cars 1 to 50 that operated before these cars.